Watteau or not Watteau ? 21/2/13 - Art market, Paris - The painting to be auctioned at Daguerre, along with Turquin’s, at the Hôtel Drouot on 27 February 2013 (ill. 1) undeniably raises many questions. Whatever the case, it does provide the occasion to tell an amusing story and discover an intriguing enigma : Did Watteau paint Seated next to You, a composition showing the artist with a palette and brushes in his hand, next to Jean de Julienne, in a wooded landscape ? If he did, was the work destroyed ? And, finally, if it did not disappear for good, is it then the painting which is coming up for auction ? First off, let us look at some proven facts. An engraving by Tardieu (ill. 2) represents this composition, but the absence of any mention of this painting in old auctions as well as of replicas or copies led art historians to think that the work had never really existed and that it was simply a pastiche imagined by Jean de Julienne who used it to highlight his famous Recueil. However, it seemed improbable that the collector and patron would allow himself such liberty as to imagine a false Watteau. But when comparing the two acknowledged preparatory drawings by the artist representing, in the first case studies of Julienne’s hands and, in the second, a study for his own portrait, we have proof that the painting did indeed exist. One of the leading specialists on the artist, Martin Eidelberg, demonstrates it in his essay available on his website devoted to Watteau and his circle. Even if all art historians do not agree on this theory, we can nevertheless deduct from these two preparatory drawings that Watteau thought up this composition and probably painted it. What became of the painting ? Can the one which has just resurfaced be by the artist (it is cautiously presented as "attributed to" with a low estimate) ? 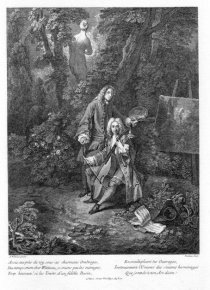 Martin Eidelberg, who has only seen it through photographs, does not believe so (but does not categorically exclude it), especially since he found, in a catalogue of the Julienne auction of 1767, an inscription by Mariette concerning a Self-portrait in Bust by Watteau, in turn known thanks to a Tardieu engraving. Mariette writes : "It is in a deplorable state. These are remnants from a larger composition for which we have the engraving in which we see the painter accompanied by Mr. De Julienne playing the bass viol." Is this wood fragment a self-portrait (which never reappeared and whose existence has been questioned) or the remains of Seated next to You ? We must of course now examine the painting coming up for auction. Its state is mediocre, something which could argue in its favor. 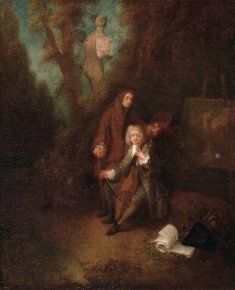 We know that Watteau’s technique was not perfect and that many of his works today are very damaged and have an aspect similar to the one apparent on this canvas. The presence of some repainted areas makes it hard to evaluate but the best preserved parts are of very good quality, not at all incompatible with Watteau’s art. Alan Wintermute, who has seen the work only in photographs also, does not entirely exclude the possibility that this might be a Watteau but does not wish to make an official pronouncement given the condition of the canvas. However, Christoph Vogtherr, who saw it, does not believe in this attribution, and does not recognize Watteau’s hand, saying that he believes the original painting disappeared. Finally, Pierre Rosenberg told us that he has not yet seen the work and is thus reserving his opinion for the moment. In short, it is practically impossible to come to a definitive conclusion, reminding us that art history is far from being an exact science. We might recall, again on the subject of Watteau, the recent purchase by the Getty of a painting which was sold as "French school around 1720, circle of Antoine Watteau" and which today does indeed appear to be acknowledged as an original by the master.